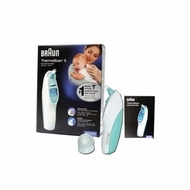 Braun ThermoScan IRT 4020 Ear Thermometer Register of Therapeutic Goods (ARTG) Number: 108746 Includes 2 Year guarantee 21 x Lens filters 1 x Protective cap 2 x Duracell AA batteries Features Clinically tested, number 1 ear thermometer - used by more GP's and mothers worldwide Unique Thermoscan Feedback system confirms in seconds the thermometer is in the correct position & an accurate reading has been taken Accurate and safe for newborns and the whole family, ultra soft and gentle tip is warmed up for accuracy and extra comfort Temperature results in degrees C or degrees F 1 memory recall Braun Thermoscan is number one amoungst doctors and mothers. It is used by more doctors' offices and mothers than any other infrared thermometer brand. The ear is regarded as the most reliable place to get a consistent reading of the humans core body temperature. You should measure your child?s temperature regularly to understand their normal reading, so you can recognize signs of fever early.